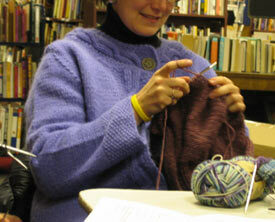 Anna made it back from Mass Sheep & Wool just in time to make it to Knitsmiths and finish her first Opal "Acapulco" sock. 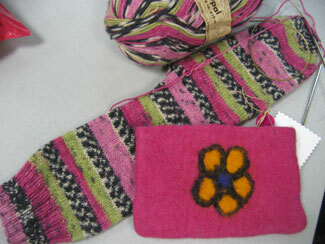 Look, it matches the little felted purse she picked up at the festival. 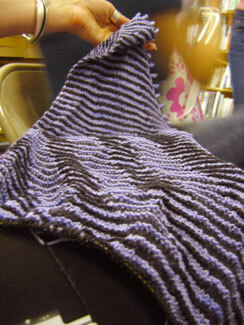 She's working on cool stripey Jaywalkers (sorry Anna, you can't be part of the no-Jaywalkers club anymore!) 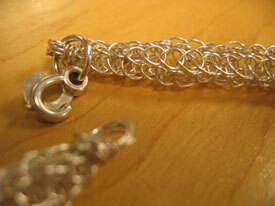 and a beautiful shadow knitting wrap. 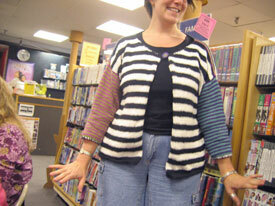 And doesn't she look fabulous in her Bobblicious shrug?! 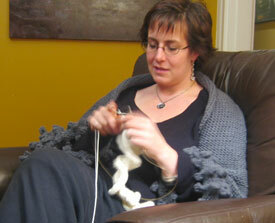 She's working on a beautiful ruffle scarf from Scarf Style. 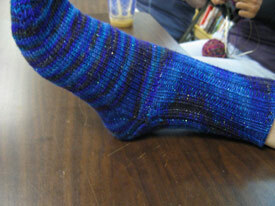 And was wearing her very purpley Vera socks. 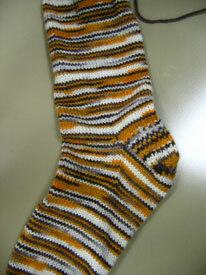 Anna is also working on socks. 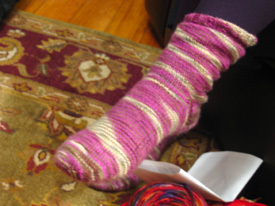 There's the watermelon sock she had with her last week, a Trekking sock just like Lisa's (in fact, it was Anna's pretty Trekking sock that inspired Lisa to make a pair for herself), and now this cool sparkly sock. 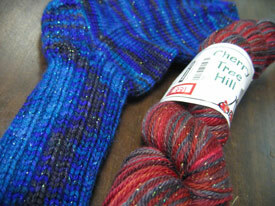 She's got more of the sparkly Super Glitz yarn from Cherry Tree Hill to make another pair. 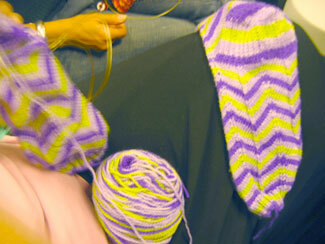 More fabulous hand-dyed yarn from Dani. 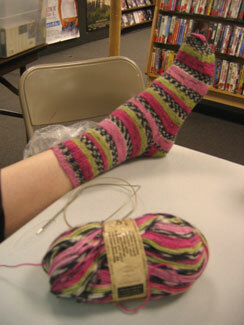 This is her "watermelon" colorway that Anna is knitting up. I so want some. Yum! Like Vicki, Dani was with us too in absentia. 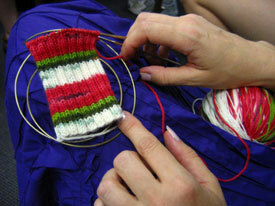 Anna was knitting up a pair of socks in Dani's own hand-dyed tiger stripe yarn. Awesome job, Dani. Way cool! 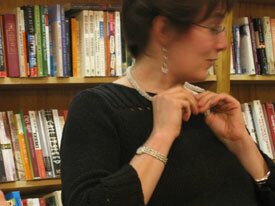 This week it was her incredible Addi Pearls necklace. Anna is so fun. Look at her new, stripey spring cardigan and just try not to smile. 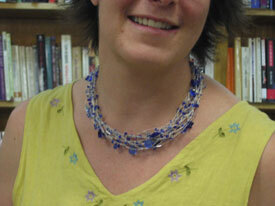 Anna wowed us all this week by bringing in a stunning necklace she'd knitted out of wire. It's so beautiful! And she says it's easy to do. 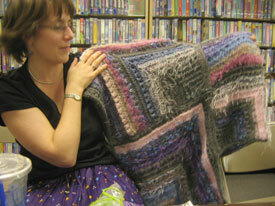 We're thinking about making this a Knitsmiths' group project and having Anna show us all how to make one ourselves. I can't wait! The proof: Anna's cheery spring green lace tunic. Look at Anna's amazing Dancing Crayons poncho! 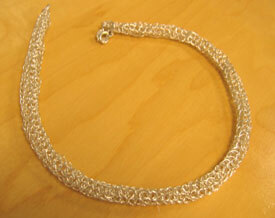 New Knitsmith, Anna, has shown us that Lopi can be beautiful. And purple.